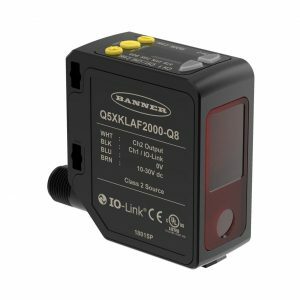 The new Q5X background suppression laser sensor extends Banner Engineering’s portfolio of powerful, problem-solving sensors. The best-in-class laser triangulation sensor features a range from 9.5 cm (4 inches) to 2 m (6 ft. 6 inches), is easy to use, and provides reliable detection of the most challenging targets. The Q5X sensor solves the most difficult distance-based applications, even at acute angles. The high-power laser sensor features an exceptionally high excess gain, which enables the sensor to reliably detect extremely dark objects, black targets against a black background, black targets against a shiny metal background, clear and reflective objects, multicolor packaging, and targets of all colors. With industry-standard rectangular housing and 270-degree rotatable M12 QD, the Q5X sensor meets a wide variety of mounting constraints. In addition, the sensor features stable detection all the way to 2 meters even at an angle, which enables even greater mounting flexibility. The sensor is rated IP67 for reliable performance in wet environments. The Q5X features a durable, cost-effective plastic housing, and an extensive offering of metal protective brackets for the most difficult industrial environments. With an intuitive user interface, the Q5X sensor is simple to deploy quickly, saving time and costs. In addition, dual teach mode enables the sensor to verify multiple conditions—such as part presence and orientation—with a single device. The Q5X is highly configurable and can be programmed via on-board user interface, remote teach, IO-Link, or optional Remote Sensor Display (RSD). The RSD enables remote setup and monitoring, and it stores up to 6 configurations to facilitate product changeover and simplify device replacement. The RSD can remain in-line to easily monitor sensors in difficult-to-reach locations or can be removed after configuration. 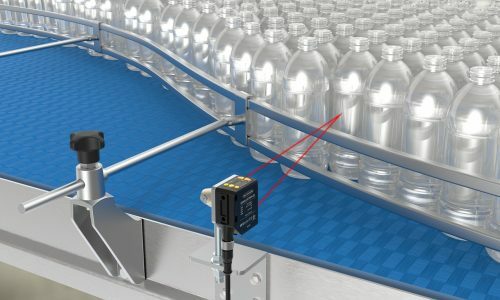 The Q5X background suppression sensor detects when the staging area is clear of bottles and the system is ready for the next layer of containers.